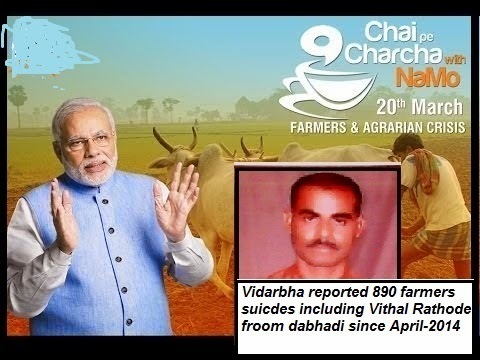 Since Indian finance minister haven seera ( sweet ) ceremony to sent for printing the copies of the NDA Modi vision base Budget-2015 last Monday ,vidarbha region of Maharashtra which is epicenter of farmer suicide spiral in India has reported 14 innocent farmers fresh suicides including one from village Dabhadi where on 20th march 2014 PM Narendra Modi has arranged “chair pe charcha” with farmers and had made pre-poll promises on farm loans waiver and giving higher MSP according to a proposed formula of investment plus 50 percent returns but recent signals given by NDA Govt. that the BJP of treating the issue of minimum support prices (MSP) and waiver of farm loans as a 'Jumla' (empty election promise) and sidelined the rural and agrarian crisis before the economic reforms and PPP base investment as priority and there is no hope in the upcoming Union budget to get any relief to address the acute agrarian crisis with focus on credit, cost and crop issues hence to stop farmers suicides, Key farmers' advocacy group in the drought-prone Vidarbha region, Janandolan Samiti here demanded from the Centre to relook in to budgetary allocation as Maharashtra's Vidarbha region has been witnessing thousands of suicides by the farmers in the past due to debt, drought and crop failure. When poor are demanding food under universal PDS and farmers are killing themselves due to debt and poor prices of agriculture produce, Indian Govt. is planning to withdraw present structure of PDS byway DBT and diverting agriculture budgetary allotment in so called investment infrastructure, this will make life of poor and farmer miserable, VJAS president, Kishore Tiwari, said in a press release here. When the state government officially declared that 60 per cent of its villages were facing a "severe drought" of the century, last year, affecting almost 90 lakh farmers in state, 23,811 of state's total 39,453 villages fall under this category after complete kharif crop was damaged, Vidarbha region experienced fourth drought in the state since 2008 in row, forcing more than 40,000 debt-trapped farmers to kill themselves during the period, he claimed. 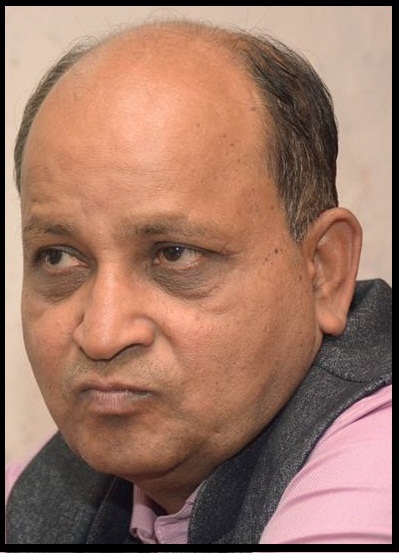 He said the NDA ruling-government had made Vidarbha farm suicide a major election issue and had promised of better cost and credit for farm produce but economic agenda and recent statements of ministers and officials, reflect that are deviating from their promises as the centre filing an affidavit in the Supreme Court that the government cannot give the MSP on the basis of the BJP's proposed formula of investment plus 50 percent returns as it goes contrary to all existing formulae of the Commission on Agriculture Costs and Prices.Similarly, the Reserve Bank of India (RBI) has said that since all earlier farm loans waiver packages have failed to provide relief and such packages would add to banks' NPAs - dashing all hopes of the debt trapped farmers for any relief in the next Union Budget. “All relief packages never focused on credit, cost and crop issues, hence failed to curb the existing distress this year too. The state government has released relief worth Rs 2,000 crore so far, and moreover asked the Central government aid worth Rs 4,800 crore and has given only Rs.500 crore hence, in view 1,160 farmers suicides in Maharashtra in 2014, and 120 in 2015 (till date), this year may prove to be worse for the agrarian communities in the country, it was high time that the Centre looks at agrarian crisis seriously in Vidarbha and announce special plan to address existing despair," Tiwari said urging Prime Minister Narendra Modi to look into the matter.